Background Hamstring strain injuries (HSIs) are common within the Australian Football League (AFL) with most occurring during high-speed running (HSR). Therefore, this study investigated possible relationships between mean session running distances, session ratings of perceived exertion (s-RPE) and HSIs within AFL footballers. Methods Global positioning system (GPS)-derived running distances and s-RPE for all matches and training sessions over two AFL seasons were obtained from one AFL team. All HSIs were documented and each player's running distances and s-RPE were standardised to their 2-yearly session average, then compared between injured and uninjured players in the 4 weeks (weeks −1, −2, −3 and −4) preceding each injury. Results Higher than ‘typical’ (ie, z=0) HSR session means were associated with a greater likelihood of HSI (week −1: OR=6.44, 95% CI=2.99 to 14.41, p<0.001; summed weeks −1 and −2: OR=3.06, 95% CI=2.03 to 4.75, p<0.001; summed weeks −1, −2 and −3: OR=2.22, 95% CI=1.66 to 3.04, p<0.001; and summed weeks −1, −2, −3 and −4: OR=1.96, 95% CI=1.54 to 2.51, p<0.001). However, trivial differences were observed between injured and uninjured groups for standardised s-RPE, total distance travelled and distances covered whilst accelerating and decelerating. Increasing AFL experience was associated with a decreased HSI risk (OR=0.77, 95% CI 0.57 to 0.97, p=0.02). Furthermore, HSR data modelling indicated that reducing mean distances in week −1 may decrease the probability of HSI. Conclusions Exposing players to large and rapid increases in HSR distances above their 2-yearly session average increased the odds of HSI. However, reducing HSR in week −1 may offset HSI risk. The predominant injury mechanism for hamstring strain injuries is high-speed running;2 however, no studies have explored the effect of high-speed running distances on the risk of hamstring injury. Therefore, the aim of this study was to determine whether running distances and s-RPE were associated with an increased risk of hamstring strain injury in elite AFL players. We hypothesised that rapid and large increases in high-speed running distances over 4 weeks might influence hamstring strain injury risk. This study employed an observational prospective cohort design and was completed over 102 weeks spanning the 2013 and 2014 AFL and the concurrent ‘reserves’ competition (North East AFL) seasons (November 2012—August 2013 and November 2013—August 2014). All participants had their running distances collected via GPS devices (V4 Catapult, South Melbourne, Australia) and s-RPE collected via SMARTABASE (Fusion sport, Brisbane, Australia). Fifty-one elite male footballers (age=22.2±3.4 years, height=188.2±7.1 cm, mass=86.6±8.7 kg with a median of 4 years (range 1–12 years)) of AFL playing experience from a single AFL team were recruited for this study. The university's human research ethics committee approved the study and participants gave informed written consent. GPS measures of athlete movements have previously been reported to be reasonably accurate and reliable.15 ,16 Each player was fitted with a 10 Hz GPS unit (V4 Catapult) contained within their guernsey or undergarment on the upper back during all running sessions and games throughout the two-season observational period. Uploaded data containing ‘signal dropout’ errors or players not involved in the football drills were removed. SMARTABASE is a software platform that allows players to enter their subjective judgments of training session or match load (a product of rating of perceived exertion and duration (min)). This measurement is used in the attempt to assess how the athletes are coping with training loads, and previous work has demonstrated moderate-to-very-large associations between s-RPE and both high-speed running (r=0.51) and total distance covered (r=0.88).10 Players were required to report RPEs within 5 hours of training sessions and 4–6 hours of matches. A hamstring strain injury was defined as acute pain in the posterior thigh that caused immediate cessation of exercise.2 Damage to the muscle and/or tendon was later confirmed by the club's physiotherapist via clinical assessment or MRI examination. All reports were forwarded to the investigators at the conclusion of the competitive season. where VARWSM is a variable's weekly session mean, for each of the 4 weeks preceding each hamstring strain injury, and VAR2YSM and VAR2YSSD represent the variable's session mean and SD across the 2 years, respectively. Standardised scores of 0 then represented a ‘typical’ week for a particular player, while positive and negative scores indicated heavier or lighter than typical training loads, respectively. Injured players were those who sustained a hamstring strain injury at any stage in the 2 years including the preseason training and in-season periods. No players had a current hamstring strain injury at the start of data collection (November 2012). All statistical analyses were performed using JMP 10.02 (SAS Institute, Inc, Cary, North Carolina, USA). Independent t-tests were used to compare total high-speed running distance performed in each season between injured (INJ) and uninjured (UNINJ) groups. Paired t-tests were used to compare the high-speed running distances between the first and second season. Variables for which the 95% CIs fell below 0 in any of the 4-week ‘blocks’ prior to injury were removed from further analysis (figure 1). Standardised mean high-speed running session distance was the only variable for which the 95% CI remained above 0 (figure 1). Independent sample t-tests were used to compare 4-week mean high-speed running distances between INJ and UNINJ players in each of the 4-week blocks prior to every hamstring strain injury. Once it was established that the INJ group was performing greater standardised mean high-speed running session distances, two models were produced to assess the likelihood of hamstring strain injury. The first model examined week −1, the sum of weeks −1 and −2, the sum of weeks −1, −2 and −3, and the sum of weeks −1, −2, −3 and −4. The second model examined the association between mean high-speed running session distances observed in week −1 and the sum of weeks −2, −3 and −4 prior to injury. Age has previously been reported to be a risk factor for hamstring strain injury.2 ,18 Therefore, we assessed whether a relationship between playing experience and injury existed. This variable was added to both models. z Scores were reported as means with 95% CIs. Standardised weekly session loads (y-axis) for each of the 4 weeks prior to each injury (x-axis) are shown from top to bottom: deceleration (DEC), acceleration (ACC), total distance covered (DIST), session ratings of perceived exertion (s-RPE) and high-speed running (HSR). Dashed and solid lines represent injured and uninjured groups, respectively. Errors bars represent 95% CI. At each injury time point, z scores for the preceding 4 weeks were calculated for all players and independent sample t-tests used to compare mean session distances between INJ and UNINJ players. Logistic regression was employed to determine the OR of injury with increasing or decreasing standardised mean high-speed running session distances, in the 4 weeks leading up to injury (figure 2). Additionally, the effect of standardised mean high-speed running session distance changes in the week prior to injury on hamstring strain injury risk was modelled (figure 3). Two injuries were excluded from analysis due to missing GPS data. Statistical significance was set at p<0.05. The influence of summed 4-week standardised mean high-speed running session distances on the probability of hamstring strain injury. Average high-speed running mean session distance corresponds to 0 on the x-axis. HSI, hamstring strain injury; HSR, high-speed running. Modelling of the impact of standardised mean high-speed running (HSR) session distances in the 4 weeks prior to hamstring injury. 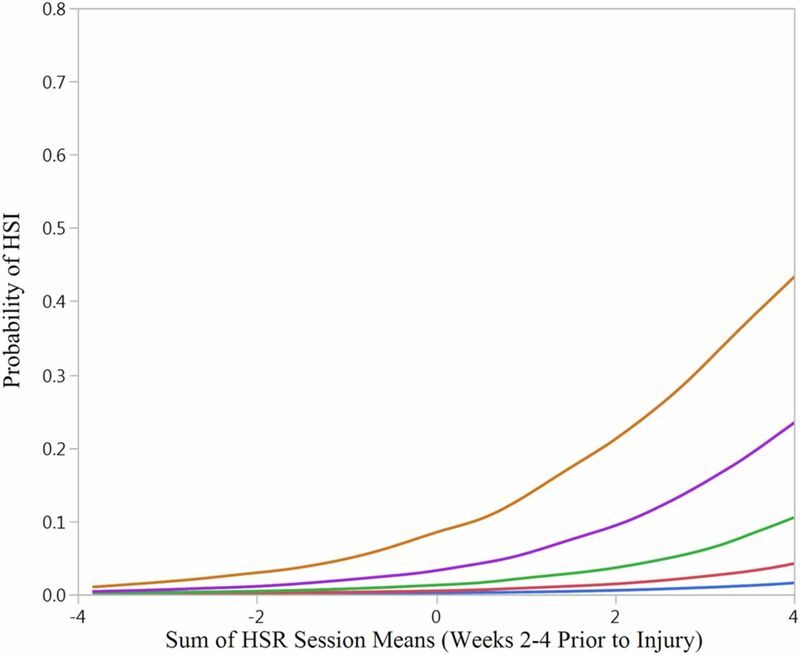 Injury risk is influenced by mean HSR session distances in weeks −4, −3 and −2 (as shown on the x-axis) and in week −1 (as shown by the curves). The probability of hamstring strain injuries can be influenced by relative high-speed running volumes in weeks −2 to −4 (x-axis) and/or week −1 prior to injury. 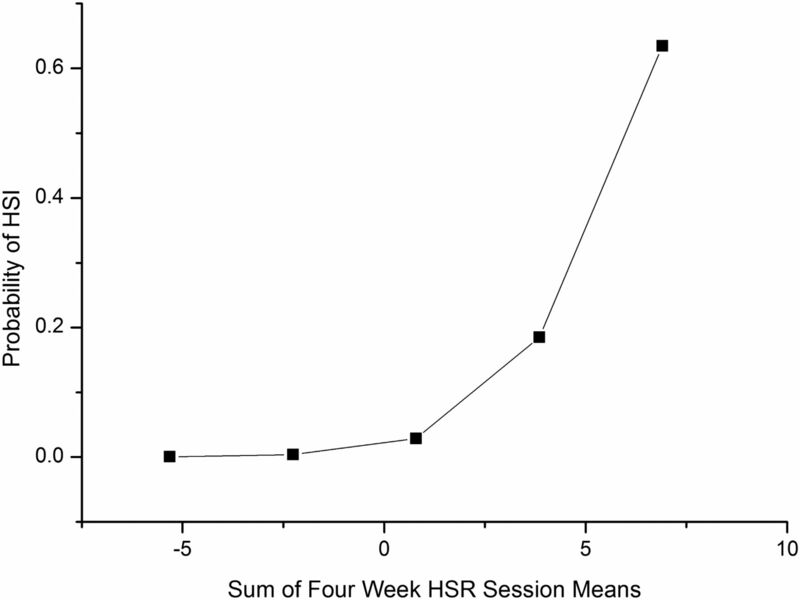 The 2-yearly average HSR session distance is represented by 0 on the x-axis. Each curve represents the standardised mean HSR session distance covered in the first week (week −1) prior to injury; top curve=high to very high (0.94–1.82), second curve=moderate to high (0.08–0.94), third curve=low to moderate (−0.82 to 0.08), fourth curve=very low to low (−1.71 to −0.82) and bottom curve=extremely low to very low (−2.62 to −1.71), z score thresholds within brackets. HSI, hamstring strain injury. Twenty-two hamstring strain injuries were sustained across the 2013 (n=11) and 2014 (n=11) seasons, all of which occurred after the first 13 weeks of each preseason. Two injuries were excluded from analysis due to incomplete data. As previously reported,19 the majority of hamstring strain injuries were sustained during match play (14 out of 20) rather than training. On average, players covered a total distance of 807±95 km in the 2013 season and 775.3±166 km in the 2014 season, of which 22.6±8 and 15.5±5 km were at high speed (>24 km/h). No significant differences were found in total absolute high-speed running distances between the INJ and UNINJ groups in 2013 (INJ mean=22.1±5 km; 95% CI 16 to 28 km; range 18–30 km; and UNINJ mean=22.6±9 km; 95% CI 20 to 25 km; range=2–46 km; p=0.90) or 2014 (INJ mean=16.6±4 km; 95% CI 14 to 19 km; range=13–23 km; and UNINJ mean=15.2±6 km; 95% CI 13 to 17 km; range=2–30 km; p=0.49). Furthermore, despite a significant reduction in the absolute distance of high-speed running between the two seasons (p<0.01), there was no decrease in injury rates. Players with >4 years of playing experience did not sustain hamstring injury: INJ (median=4, range=1–4 years) compared with UNINJ (median=4, range=1–12 years). Due to the 95% CIs falling below ‘0’ in the INJ and UNINJ in the 4 weeks leading up to injury, session ratings of perceived exertion, total distance covered, acceleration and deceleration distances (figure 1) were excluded from further analysis. However, standardised high-speed running distances were higher in the INJ than the UNINJ (figure 1). The average summed 4-week standardised high-speed running distances for INJ and UNINJ were z=2.36±2.76 and z=−0.05±1.63, respectively (p<0.001). Using logistic regression, the likelihood of hamstring strain injuries increased (OR=1.96, 95% CI 1.54 to 2.51, p<0.001) with greater relative high-speed running distances in the 4 weeks prior to injury (figure 2). The largest effect of high-speed running distance on injury risk was observed in the week prior to injury (OR=6.44, 95% CI 2.99 to 14.41, p<0.001) followed by the sum of weeks −1 and −2 (OR=3.06, 95% CI 2.03 to 4.75, p<0.001) and the sum of weeks −1, −2 and −3 (OR=2.22, 95% CI 1.66 to 3.04, p<0.001). When added to the model, greater playing experience was associated with a reduced likelihood of injury risk (OR=0.77, 95% CI 0.57 to 0.97, p=0.021) without confounding the effect of standardised high-speed running distance (OR=1.91, 95% CI 1.51 to 2.47, p=0.022; p<0.001). Figure 3 shows the impact of the final week of the 4-week mesocycle on the probability of hamstring strain injury. Here the association between the summed high-speed running session distances in weeks −4, −3 and −2 (OR=1.73, 95% CI 1.24 to 2.39, p=0.001) and the week preceding injury (OR=3.02, 95% CI 1.36 to 7.26, p=0.006) was tested and the resultant probability of hamstring strain injury determined. According to this model, the probability of hamstring strain injuries decreased with reduced standardised high-speed running distances in week −1. When experience was added to this model, a similar protective effect was observed (OR=0.78, 95% CI 0.57 to 0.96, p=0.022), and there was no evidence to suggest it confounded the other variables (summed high-speed running session distances in weeks −4, −3 and −2 OR=1.70, 95% CI 1.22 to 2.36, p=0.002, and the week preceding injury OR=2.98, 95% CI 1.33 to 7.27, p=0.007). This study is the first to investigate relationships between athlete running distances and hamstring strain injuries. Players who performed significantly more than their two-yearly average amount of high-speed running (>24 km/h) in the 4 weeks prior to injury had a greater risk of hamstring strain injury than players who did not. In contrast, hamstring strain injury risk was not influenced by the player's s-RPE, total distance covered, absolute amount of high-speed running or by the total distances covered while accelerating or decelerating. Acute high-speed running loads during week −1 had a greater impact on injury risk compared with chronic loads (the sum of −2, −3 and −4). These findings demonstrate that transiently elevated high-speed running distances increase the likelihood of hamstring strain injury. A secondary finding was that an increase in playing experience resulted in a small protective benefit against hamstring strain injury. Previous studies have reported relationships between high transient training loads and all forms of injury.6 ,13 ,20 The results from this study add to the training injury literature6 ,9 ,11 ,21–25 by reaffirming the injury risk associated with high-speed running.13 The current model has been based on performance9 and injury risk models.11 These models are based on the premise that training load has positive and negative influences, with higher chronic loads (ie, 4 weeks) associated with better fitness9 and higher acute (ie, 1 week) loads associated with a greater risk of injury.11 Moreover, previous investigations suggest that fitness levels increase when chronic load exceeds acute load9 and injury risk increases when acute load outweighs chronic load.11 ,12 Our major finding was similar to these previous observations, whereby players exposed to large and rapid increases in high-speed running distances above their 2-yearly average were more likely to sustain a hamstring strain injury than players who were not. It was beyond the scope of this descriptive study to determine the optimal load monitoring time period to estimate future risk of hamstring injury, however, a trend was observed for briefer time frames (1-week) to have a greater effect on injury risk than longer time frames (2–4 weeks). From a training performance perspective, careful consideration should be taken when interpreting and applying the current findings to the high-performance sports setting. In alignment with earlier reports showing a positive relationship between greater training distance26 and intensity27 with improved performance, Gabbett and Ullah13 suggest a fine balance exists between training load restriction, to prevent injury, and increasing training loads to physically prepare players for competition. Therefore, taking into account the need for an appropriate stimulus to improve performance, we used the current data to produce a model, based on a common mesocycle period of 4 weeks.17 Our model suggests that players will be exposed to greater risk of hamstring strain injury when high-speed running distances extend beyond a player's typical load either acutely or chronically. Planned decreased mean high-speed running session distances in the fourth week of each mesocycle may offer the ‘balance’ between injury prevention and performance.13 As such, the execution of 3 weeks of relatively high mean high-speed running session distance followed by a recovery week, where less distance is covered, may allow the application of overload while also reducing the risk of hamstring strain injury. Therefore, the current findings provide some support for monitoring player's high-speed running and the periodisation of training load as a means of reducing hamstring strain injury risk while maintaining a desired chronic load for performance.28–30 It is noteworthy to consider that, while the current model(s) suggest particular time periods can estimate hamstring strain injury risk, other soft tissue injuries may be susceptible to different loading cycles, occurring more rapidly or slowly to changes in training volume. Finally, there is evidence to support the association between advanced age and hamstring strain injury in some2 ,18 but not all studies.31 A survey from the football departments of AFL clubs has revealed a belief among some conditioning staff that younger and older players have an elevated risk of hamstring strain injury. The rationale behind this belief was that younger players were unable to tolerate training loads and older players are unable to sufficiently recover between training sessions and matches.32 Interestingly, the current findings show a small protective benefit against hamstring strain injury with increasing playing experience. However, when interpreting these findings, it is important to consider the fact that the sample only included one AFL team and the practices performed by this club may vary significantly from other clubs. While purely speculative, it may be that more experienced players are more robust having survived the early years of an AFL career, and can manage themselves and their workloads better or are monitored more closely than less experienced teammates. In summary, this study highlighted the influence high-speed running distances performed over 4 weeks has on hamstring strain injury risk in elite AFL players. These results demonstrated the increasing likelihood of injury when athletes performed more high-speed running than that to which they were accustomed across a 4-week period. Therefore, gradual increases in each individual's standardised mean high-speed running session distance should be prescribed over a period of time, thereby ensuring players have required fitness levels for competition with a reduced risk of injury. Future work exploring the impact of periodic reductions in mean high-speed running session distance on hamstring strain injury risk is warranted. Exposure to transiently elevated high-speed running volumes, relative to those an athlete is regularly performing, increases the probability of hamstring injury. Absolute high-speed running distances were not associated with hamstring injury risk. Greater Australian Football League (AFL) playing experience was associated with lower risk of hamstring injury. How might it impact on clinical practice in the future? This model suggests the need to monitor changes in each player's high-speed running session distances. The results highlight the importance of avoiding large and rapid increases in high-speed running volumes. Reducing the volume of high-speed running every 4 weeks may reduce risk of hamstring injury.
. Modeling human performance in running. J Appl Physiol 1990;69:1171–7.
. 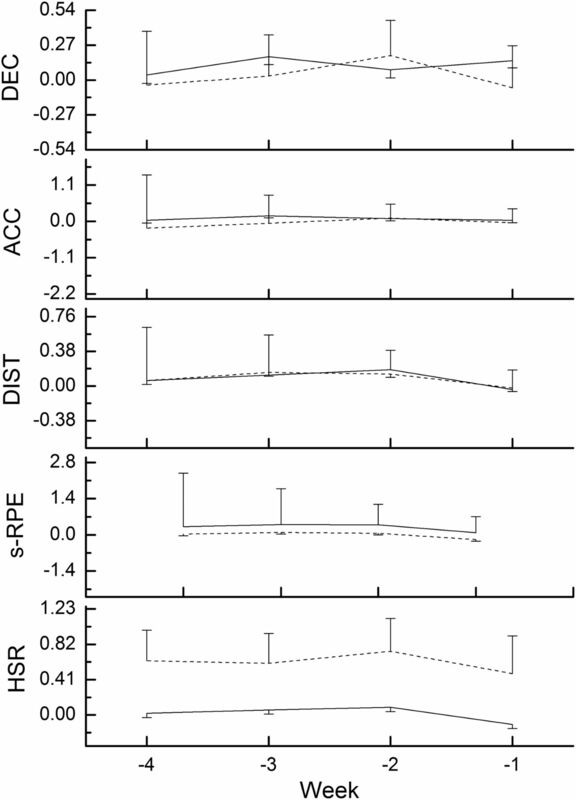 Reliability and accuracy of 10Hz GPS devices for short-distance exercise. J Sports Sci Med 2011;10:233.
. Impact of training patterns on incidence of illness and injury during a women's collegiate basketball season. J Strength Cond Res 2003;17:734–8.
. Physiological and training correlates of marathon running performance. Aust J Sports Med 1977;9:58–61.
. Periodisation of training stress--a review. Can J Sport Sci 1992;17:234–40.
. Periodization: effects of manipulating volume and intensity. Part 1. Strength Cond J 1999;21:56. Contributors SD was the principal investigator and was involved with study design, recruitment, analysis and manuscript preparation. CF was involved with data collection and analysis. AJS, DO and MW were involved with the study design, analysis and manuscript preparation. TJG was involved with analysis and manuscript preparation. All authors had full access to all of the data (including statistical reports and tables) in the study and can take responsibility for the integrity of the data and the accuracy of the data analysis. Ethics approval Queensland University of Technology Research Ethics Committee.